Having read James Newman's novel Midnight Rain not so long ago I was eager to read more by this talented author. 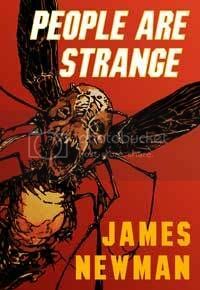 So, when the opportunity arose to read his collection of short stories entitled People Are Strange I jumped at the chance. Now, whereas Midnight Rain was a more traditional style of thriller, albeit an expertly crafted one, People Are Strange really allows the reader the chance to see just how twisted Newman can be. Not to mention funny as well, with the humour being a little on the warped side I will admit, but that is the kind of humour I relish when reading. The book itself consists of nine short stories, varying from a couple of pages in length as is the case with Bless This Meal O' Lord, which is a nasty little critter of a tale if ever there was one, to a 35 page or so novella entitled Holy Rollers which concludes the collection. Each story is prefaced by an introduction by Newman, more often than not giving a backstory to the following tale, or where he drew his inspiration from. Sometimes he just rambles! I kid you, these introductions are almost as enjoyable to read as the stories themselves. What they do convey though is the author's sense of humour, which as I previously mentioned is a little off centre. Although none of the stories herein are connected by any characters or location, they are all connected in the sense that they show people being, well, strange really. Strange, and violent, and funny, and not quite there if the truth be known. Opening with the wonderfully titled The Honest-To-God True Story of Earl P. and a Bug called Abraham Lincoln, this is a hilarious black humoured tale of murder, madness and a talking fly. It's a tale filled with rich dialogue and an abrupt ending. This is followed by my personal favourite, The Good, The Bad and the Severely Maladjusted, which I won't spoil at all, but you will not have any idea where this one will take you; it will stun you. Your Cold, Black Heart is a short sharp shocker that once again will play on your perception of what is unfolding, and is quite the headfuck in its own twisted way. The mood is then lightened, slightly I will admit as it does involve murder, by The Tell-Tale Fart. Yes, it does involve gas, bad gas i will have you know, and is quite the funny-bone tickler. Bless This Meal O' Lord is just plain evil, and I loved it. You'll definitely look forward to your dinner after this story, even though it will leave a nasty taste in your mouth! Suffer The Children is next on the agenda, and I will admit to this one being possibly my least favourite of the stories included. That being said though, it is a quite disturbing tale and is written perfectly from the point of view of a woman who isn't quite all there. Keeping up with the Joneses takes neighbourly rivalry to a whole new level, and is quite the shocker which even though it is a very dark tale it still managed to coax an illicit laugh or two from me. The next tale, entitled A Town called Hatred, really allows Newman to go overboard in the violence and shock department, which he does with a seemingly gleeful abandon. He does admit in his intro that there is no real rhyme or reason to this tale, however it is still a wonderful exercise in wanton carnage. Closing this collection is the novella Holy Rollers which, if you have ever had a visit from door to door religious types, will tickle your funny bone whilst at the same time remove it with a razor sharp scalpel. It plays on one of the things that many folk find incredibly annnoying, myself included, then turns the tables on what you might expect to happen. It is a cracker I can assure you. People Are Strange is a wonderful collection of stories, each one has its own distinctive style and really goes to show what a talented, and underrated, author Newman really is. His use of language is spot on, allowing him to bring these quite unique individuals to life with ease, regardless of the length of the story. Yes, these are tales of horror, and some are quite disturbing, but Newman never allows them to get bogged down in an endless cycle of bleak and uncaring tales. As I mentioned there is a lot of humour here, in fact most of the tales lean just as much towards dark humour as they do towards the horrfying; more often than not blending the two together perfectly. Mind you, this does all depend on your sense of humour. If Midnight Rain was Newman in a more serious frame of mind, then People Are Strange is the author playing an evil court jester; lulling you into a false sense of humour with a joke or two, before stabbing you in the gut when you least expect it. This was quite the joy to read, and at a brisk 120 or so pages, is a perfect quick read.